James Anthony Froude FRSE (/fruːd/ FROOD; 23 April 1818 – 20 October 1894) was an English historian, novelist, biographer, and editor of Fraser's Magazine. 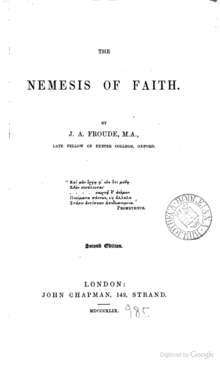 From his upbringing amidst the Anglo-Catholic Oxford Movement, Froude intended to become a clergyman, but doubts about the doctrines of the Anglican church, published in his scandalous 1849 novel The Nemesis of Faith, drove him to abandon his religious career. Froude turned to writing history, becoming one of the best known historians of his time for his History of England from the Fall of Wolsey to the Defeat of the Spanish Armada. Inspired by Thomas Carlyle, Froude's historical writings were often fiercely polemical, earning him a number of outspoken opponents. Froude continued to be controversial up until his death for his Life of Carlyle, which he published along with personal writings of Thomas and Jane Welsh Carlyle. These publications illuminated Carlyle's often selfish personality, and led to persistent gossip and discussion of the couple's marital problems. He was the son of Robert Hurrell Froude, archdeacon of Totnes, and his wife Margaret Spedding (d. 1821). James Anthony was born at Dartington, Devon on 23 April 1818. He was the youngest of eight children, including engineer and naval architect William Froude and Anglo-Catholic polemicist Richard Hurrell Froude, who was fifteen years his elder. By James' third year his mother and five of his siblings had died of consumption, leaving James to what biographer Herbert Paul describes as a "loveless, cheerless boyhood" with his cold, disciplinarian father and brother Richard. He studied at Westminster School from age 11 until 15, where he was "persistently bullied and tormented". Despite his unhappiness and his failure in formal education, Froude cherished the classics and read widely in history and theology. Beginning in 1836, he was educated at Oriel College, Oxford, then the centre of the ecclesiastical revival now called the Oxford Movement. Here Froude began to improve personally and intellectually, motivated to succeed by a brief engagement in 1839 (although this was broken off by the lady's father). He obtained a second class degree in 1840 and travelled to Delgany, Ireland as a private tutor. He returned to Oxford in 1842, won the Chancellor's English essay prize for an essay on political economy, and was elected a fellow of Exeter College. Froude's brother Richard Hurrell had been one of the leaders of the Oxford Movement, a group which advocated a Catholic rather than a Protestant interpretation of the Anglican Church. Froude grew up hearing the conversation and ideas of his brother with friends John Henry Newman and John Keble, although his own reading provided him with some critical distance from the movement. During his time at Oxford and Ireland, Froude became increasingly dissatisfied with the Movement. Froude's experience living with an Evangelical clergyman in Ireland conflicted with the Movement's characterisation of Protestantism, and his observations of Catholic poverty repulsed him. He increasingly turned to the unorthodox religious views of writers such as Spinoza, David Friedrich Strauss, Emerson, Goethe, and especially Thomas Carlyle. Froude retained a favourable impression of Newman, however, defending him in the controversy over Tract 90 and later in his essay "The Oxford Counter-Reformation" (1881). Froude agreed to contribute to Newman's Lives of the English Saints, choosing Saint Neot as his subject. However, he found himself unable to credit the accounts of Neot or any other saint, ultimately considering them mythical rather than historical, a discovery which further shook his religious faith. Nevertheless, Froude was ordained deacon in 1845, initially intending to help reform the church from within. However, he soon found his situation untenable; although he never lost his faith in God or Christianity, he could no longer submit to the doctrines of the Church. He began publicly airing his religious doubts through his semi-autobiographical works Shadows of the Clouds, published in 1847 under the pseudonym "Zeta", and The Nemesis of Faith, published under his own name in 1849. The Nemesis of Faith in particular raised a storm of controversy, being publicly burned at Exeter College by William Sewell and deemed "a manual of infidelity" by the Morning Herald. Froude was forced to resign his fellowship, and officials at University College London withdrew the offer of a mastership at Hobart Town, Australia where Froude had hoped to work while reconsidering his situation. Froude took refuge from the popular outcry by residing with his friend Charles Kingsley at Ilfracombe. His plight won him the sympathy of kindred spirits, such as George Eliot, Elizabeth Gaskell, and later Mrs. Humphrey Ward. Mrs. Ward's popular 1888 novel Robert Elsmere was largely inspired by this era of Froude's life. At Ilfracombe Froude met and soon married Charlotte Grenfell, Kingsley's sister-in-law and daughter of Pascoe Grenfell. The two moved first to Manchester and then to North Wales in 1850, where Froude lived happily, supported by his friends Arthur Hugh Clough and Matthew Arnold. Prevented from pursuing a political career because of legal restrictions on deacons (a position which was at the time legally indelible), he decided to pursue a literary career. He began by writing reviews and historical essays, with only sporadic publications on religious topics, for Fraser's Magazine and the Westminster Review. Froude soon returned to England, living at London and Devonshire, in order to research his History of England from the Fall of Wolsey to the Defeat of the Spanish Armada, on which he worked for the next twenty years. He worked extensively with original manuscript authorities at the Record Office, Hatfield House, and the village of Simancas, Spain. Froude's historical writing was characterised by its dramatic rather than scientific treatment of history, an approach Froude shared with Carlyle, and also by Froude's intention to defend the English Reformation (which he asserted was "the hinge on which all modern history turned" and the "salvation of England") against the interpretations of Catholic historians. Froude focused on figures such as Henry VIII and Elizabeth I, although he became increasingly unfavorable to Elizabeth over the course of his research. Furthermore, he directly expressed his antipathy towards Rome and his belief that the Church should be subordinated to the state. As a result, when the first volumes of Froude's history were published in 1856 they drew the ire of liberals (who felt that Froude's depiction of Henry VIII celebrated despotism) and Oxford High Churchmen (who opposed his position on the Church); this hostility was expressed in reviews from the Christian Remembrancer and the Edinburgh Review. The work was a popular success, however, and along with Froude's 1858 repudiation of his early novels helped him regain much of the esteem he had lost in 1849. Following the death of Thomas Macaulay in 1859, Froude became the most famous living historian in England. Beginning in 1864 Edward Augustus Freeman, a High Churchman, launched a critical campaign against Froude in the Saturday Review and later in the Contemporary Review, somewhat damaging Froude's scholarly reputation. In 1879, Freeman's review in the Contemporary Review of Froude's Short Study of Thomas Becket incited Froude to respond with a refutation in The Nineteenth Century which largely discredited Freeman's attacks and reaffirmed the value of Froude's manuscript research. In 1860, Froude's wife Charlotte died; in 1861, he married her close friend Henrietta Warre, daughter of John Warre, M.P. for Taunton. Also in 1861 Froude became editor of Fraser's Magazine following the death of former editor John Parker, who was also Froude's publisher. Froude retained this editorship for fourteen years, resigning it in 1874 at the request of Thomas Carlyle, with whom he was working. In 1869 Froude was elected Lord Rector of St. Andrews, defeating Benjamin Disraeli by a majority of fourteen. In 1870, following the passage of the Clerical Disabilities Act (c. 91, Vict. XXXIII & XXXIV)("Bouverie's Act"), which permitted priests and deacons to resign from Holy Orders, Froude was finally able to officially rejoin the laity. ln a prize-winning work published in 1981, the historian J. W. Burrow remarked of Froude that he was a leading promoter of the imperialist excitement of the closing years of the century, but that in the mass of his work even empire took second place to religion. Soon after the completion of the History of England in 1870, Froude began research for a history of Ireland. As with his earlier work, English in Ireland in the Eighteenth Century was opinionated, favouring Protestantism over Roman Catholicism and often attempting to justify England's treatment of Ireland, particularly under Oliver Cromwell; a figure hated by the Irish. Froude argued that Ireland's troubles were the result of too little English control, and that an even greater English presence—an "enlightened despotism",—was needed to alleviate problems that were inherent to Ireland. In September 1872, Froude accepted an invitation to lecture in the United States, where his work was also well known. At the time, Americans (particularly Irish-Americans) generally believed in the destructiveness and injustice of Britain's Irish policies, and Froude hoped to change their views. The lectures, widely discussed, raised the expected controversy, with opposition led by the Dominican friar Father Thomas Nicholas Burke. Opposition caused Froude to cut his trip short, and he returned to England disappointed both by his impression of America and by the results of his lectures. In England, too, Froude's Irish history had its critics, most notably William Edward Hartpole Lecky in his History of England in the Eighteenth Century, the first volumes of which were published in 1878, and in reviews in Macmillan's Magazine. In February 1874, shortly before completion of English in Ireland, Froude's wife Henrietta died, after which Froude moved from London to Wales. As a means of diversion, Froude travelled to the Southern African Colony of Natal, unofficially for colonial secretary Lord Carnarvon, to report on the best means of promoting a confederation of the colonies and states of southern Africa. This region, seen as vital for the security of the Empire, was only partially under British control. Confederating the various states under British rule was seen as the best way of peacefully establishing British control and ending the autonomy of the remaining independent states. On his second trip to Southern Africa in 1875, Froude was an imperial emissary charged with promoting confederation, a position which conflicted at times with his habit for lecturing on his personal political opinions. In the Cape, his public statements advocating the use of forced labour on the indigenous Xhosa people were particularly controversial. All the more so as the Cape Colony at the time was under the rule of the relatively inclusive Molteno-Merriman Government, whose stated policy was to treat its Xhosa citizens as "fellow subjects with white men", and which was accused of being "rabid in its anti-Imperialist stance". Relations were not improved by Froude's disdain for the Cape's local politics and of the "Cape politicians [who] strut about with their Constitution as a schoolboy newly promoted to a tail coat, and...imagine that they have the privileges of perfect independence, while we are to defend their coasts and keep troops to protect them in case of Kaffir insurrection." Overall though, the idea of confederation under Britain was not popular in the Southern African states, which were still unstable and simmering from the last bout of British imperial expansion (President Brand of the Orange Free State refused outright to even consider it). However, in his travels through different parts of southern Africa, Froude gained some support through publicly agitating for pet local causes. "Chameleon-like, his politics assumed the colour of his surroundings", was how the Cape Argus newspaper described his strategy. The Cape was by far the largest and most powerful state in the region, and Froude thus sought audience with its Prime Minister, John Molteno, to convey Carnarvon's request that he lead the region's states into British confederation. However Molteno declined, telling Froude that the confederation attempt was premature, that the country was "not ripe for it", and that his government would not support it in the politically volatile region. He made the additional point that any federation with the illiberal Boer republics would endanger the rights and franchise of the Cape's Black citizens, and that overall "the proposals for confederation should emanate from the communities to be affected, and not be pressed upon them from outside." Froude responded by openly allying with a radical white opposition party, the “Eastern Cape Separatists”, promising a baronetcy to its leader Paterson if he would overthrow the Cape’s elected government. In a public speech on 25 July 1876, challenging the Cape Government, he declared, "We want you to manage your natives as they do in Canada and Australia". He also promised to create a separate white Eastern Cape, and to impose a forced labour system onto the Cape’s African population along “Transvaal lines” while confiscating Xhosa and Basotho land for redistribution to white farmers. Molteno, furious, condemned Froude’s statements, accused Froude of imperial interference in the Cape Colony’s democracy, and told the British Colonial Office that he was prepared to sacrifice his job to keep the Cape out of such a confederation. Meanwhile Merriman wrote to London accusing the "Imperial Agent" of desiring to subject and exterminate the Cape's Xhosa citizens. The Ministers of the Cape Parliament went on to accuse Carnarvon of attempting to use the Cape to oppress the region and bring upon a war with the neighbouring Xhosa and Boer states. After Merriman confronted Froude in person, at an Uitenhage event which degenerated into fist fights, Froude gave no further public speeches. "If anybody had told me two years ago that I should be leading an agitation within Cape Colony, I should have thought my informant delirious. The (Cape) Ministers have the appearance of victory, but we have the substance." Froude's observations on Africa were presented in a Report to the Secretary of State and a series of lectures for the Philosophical Society of Edinburgh, both of which were adapted into essays for inclusion in Froude's essay collection Short Studies on Great Subjects. In 1876, he was appointed to two Royal Commissions, the first into the "Laws and Regulations relating to Home, Colonial, and International Copyright" and the second "into various matters connected with the Universities of Scotland." Froude had been a close personal friend as well as an intellectual disciple of Thomas Carlyle since 1861, and the two became even closer after the death of Carlyle's wife Jane Welsh on 21 April 1866. Reading Jane's diaries and letters, Carlyle was struck by her unhappiness and his own irritability and inconsideration for her, and he decided to atone by writing her a memorial. In 1871, Carlyle gave Froude this memorial along with a bundle of Jane's personal papers, to be published after Carlyle's death, if Froude so decided. Also, Carlyle appointed Froude one of his own literary executors, although he was (perhaps intentionally) ambiguous in his instructions. Shortly after Carlyle's death in 1881, Froude published Carlyle's Reminiscences of Jane Welsh Carlyle. Carlyle's niece, Mrs. Alexander Carlyle, presented a note written by Carlyle in 1866 stating that the volume should not be published. On the basis of this note, she accused Froude of misconduct in publishing the volume, even though the fact that Carlyle had given the volume to Froude five years later suggested that he had changed his mind. Mrs. A. Carlyle also made claims of ownership over her uncle's papers, and over the profits from their publication. The conflict discouraged Froude from continuing his biography of Carlyle, as he wrote in 1881, "So much ill will has been shown me in the case of the other letters that I walk as if on hot ashes, and often curse the day when I undertook the business." However, he was implored by Carlyle's brother James and sister Mrs. Austin to continue the work, and in 1882, published the first two volumes. Froude wrote his Life of Carlyle according to what he understood as Carlyle's own biographical principles, describing not only Carlyle's intellectual greatness but also his personal failings. Many readers, however, focused upon the latter, particularly Carlyle's unhappy relationship with his wife which soon became a widely used illustration in discussions of the sexual politics of marriage. Controversy was heightened by Froude's publication of Letters and Memorials of Jane Welsh Carlyle, Jane's own writings, in 1883, and the completion of the Life of Carlyle in 1884. Amongst the strongest critics of Froude's biographical work was novelist Margaret Oliphant, who wrote in the Contemporary Review of 1883 that biography ought to be the "art of moral portrait painting" and described the publication of Jane Carlyle's papers as the "betrayal and exposure of the secret of a woman’s weakness." After Froude finished his work, ownership of the manuscript material was passed to Mrs. Alexander Carlyle, who quickly authorised alternative biographical volumes by Charles Eliot Norton that excised the offensive material. The controversy persisted for so long that in 1903, nearly ten years after Froude's death, his daughters decided to publish My Relations with Carlyle, which their father had written in 1887; in this pamphlet Froude attempted to justify his decisions as biographer, yet went further than his official biography had by speculating that Carlyle's marriage was unconsummated due to impotence. Following completion of the Life of Carlyle Froude turned to travel, particularly through the British colonies, visiting South Africa, Australia, New Zealand, the United States, and the West Indies. 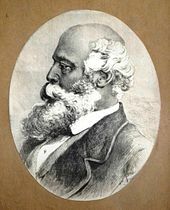 From these travels, he produced two books, Oceana, or, England and Her Colonies (1886) and The English in the West Indies (1888), which mixed personal anecdotes with Froude's thoughts on the British Empire. Froude intended, with these writings, "to kindle in the public mind at home that imaginative enthusiasm for the Colonial idea of which his own heart was full.". However, these books caused great controversy, stimulating rebuttals and the coining of the term Froudacity by Afro-Trinidadian intellectual John Jacob Thomas, who used it as the title of, Froudacity. West Indian fables by J. A. Froude explained by J. J. Thomas, his book-length critique of The English in the West Indies. During this time, Froude also wrote a historical novel, The Two Chiefs of Dunboy, which was the least popular of his mature works. As with his earlier book on Irish history, Froude used the book to turn an Irish hero into a villain with historical distortion. On the death of his adversary Freeman in 1892, Froude was appointed, on the recommendation of Lord Salisbury, to succeed him as Regius Professor of Modern History at Oxford. The choice was controversial, as Froude's predecessors had been amongst his harshest critics, and his works were generally considered literary works rather than books suited for academia. Nevertheless, his lectures were very popular, largely because of the depth and variety of Froude's experience and he soon became a Fellow of Oriel. Froude lectured mainly on the English Reformation, "English Sea-Men in the Sixteenth Century," and Erasmus. The demanding lecture schedule was too much for the ageing Froude. In 1894 he retired to Woodcot in Kingsbridge, Devonshire. He died on 20 October 1894 and is buried in Salcombe Cemetery. Froude was married twice: firstly in 1849 to Charlotte Maria Grenfell (d.1860); secondly in 1861 to Henrietta Elizabeth Wade (d.1874). He was survived by one daughter (Margaret) of his first wife Charlotte Maria, née Grenfell, and by a son (Ashley Anthony Froude, C.M.G) and a daughter (May) of his second wife Henrietta Elizabeth, née Warre. Ashley Anthony Froude was born in 1863 at Paddington, London, England. He married Ethel Aubrey Hallifax, daughter of Albert Praed Hallifax and Isabella Aubrey Coker, in 1897 at Chelsea, London, England. He died on 17 April 1949. He was appointed Companion, Order of St. Michael and St. George (C.M.G.) and held the office of Justice of the Peace (J.P.) His son was John Aubrey Froude1 b. 1898, d. 22 Sep 1914 who died when H.M.S. Cressy was torpedoed by U.9. ^ West Coast Times and Observer (2337), New Zealand, 27 March 1873, p. 3, For he swears by the rood/That his name it is Froude . ^ Markus, J. Anthony Froude: The Last Great Undiscovered Victorian, epigraph . ^ a b Paul 1906, p. 110. ^ Paul 1906, p. 20. ^ Paul 1906, p. 11. ^ Froude, James Anthony (1873), The English in Ireland in the eighteenth century. ^ Lewsen 1982, p. 55. ^ Basil T. Hone (1993), The First Son of South Africa to be Premier: Thomas Charles Scanlen, Oldwick, New Jersey: Longford Press, p. 61, Froude was acclaimed nearly everywhere he went on his speaking tour, but the support he found was not so much for the conference as for his endorsement of pet local causes. Separatists would have separation; the Cape Dutch would have redress for their cousins in the Dutch Republics over Griqualand West; and conservatives would have a strict disciplinary native policy. "Chameleon-like, his politics assumed the colour of his surroundings", said a Cape Argus editorial. Froude became more confident of the success of his mission when his Lord and Master Carnarvon decided to switch the site of the conference to Natal. That decision contained the threat - empty as it turned out because Natal and the Republics would not play ball - that the Confederation might comprise Natal, Griqualand West and one or both Dutch Republics, leaving the Cape out in the cold. These hardball tactics produced exactly the opposite of their intended effect upon the Molteno Ministry. It became more rabid in its anti-Imperialist stance. John X. Merriman, who had come to accept responsible government and had become Molteno's Commissioner of Crown Lands and Public Works, mounted slashing counter-attacks upon Froude, "the Imperial Agent." The rhetoric culminated in the famous bread-roll War. Suffice it to say that, with emotions running very high, it was imprudent for the Mayor of Uitenhage to invite the Imperial Agent to a luncheon in honour of the Minister of Crown Lands and Public Works. As Merriman got warmed up on the subject of Imperial agitation, guests - including Paterson - interrupted the Minister, to the annoyance of his supporters. The culmination was a bombardment of the top table with bread rolls, and fist fights among guests. Merriman's remarks may have been ill-advised and intemperate, but the incident did at least persuade Froude to stop making speeches. ^ V.C.Malherbe: What They Said. 1795-1910 History Documents. Cape Town: Maskew Miller. 1971. p.144-145. ^ Newton 1924, pp. 24-29. ^ N. Mostert: Frontiers: The Epic of South Africa's Creation and the Tragedy of the Xhosa People. Pimlico: London, 1993. ISBN 0-7126-5584-0, p.1247. ^ Lewsen 1982, p. 54. ^ Molteno 1900, Vol. 2. ^ Eybers 1918, pp. 448-453. ^ "No. 24316". The London Gazette. 21 April 1876. p. 2574. ^ "No. 24319". The London Gazette. 28 April 1876. p. 2668. ^ "No. 24988". The London Gazette. 24 June 1881. p. 3208. ^ "Review of Reminiscences by Thomas Carlyle edited by James Anthony Froude". The Quarterly Journal. 151: 385–428. April 1881. ^ "Ninetteen duel from Galway", Irish Post, Irish Abroad . ^ "No. 26280". The London Gazette. 19 April 1892. p. 2318. ^ "Review of Thomas Carlyle: a History of the First Forty Years of his Life, 1795–1835 by J. A. Froude, 1882 and Thomas Carlyle: a History of his Life in London, 1834–1881 by J. A. Froude, 1884". The Quarterly Review. 159: 76–112. January 1885. ^ "Review of Oceana by James Anthony Froude". Science. VII (164): 292–294. 26 March 1886. Hesketh, Ian (2008), "Diagnosing Froude's Disease: Boundary Work and the Discipline of History in Late-Victorian Britain", History and Theory, 47 (3), pp. 373–395, doi:10.1111/j.1468-2303.2008.00460.x . Molteno, Percy A. (1900), The life and times of Sir John Charles Molteno, K. C. M. G., First Premier of Cape Colony, Comprising a History of Representative Institutions and Responsible Government at the Cape, 2 (Confederation), London: Smith, Elder & Co.